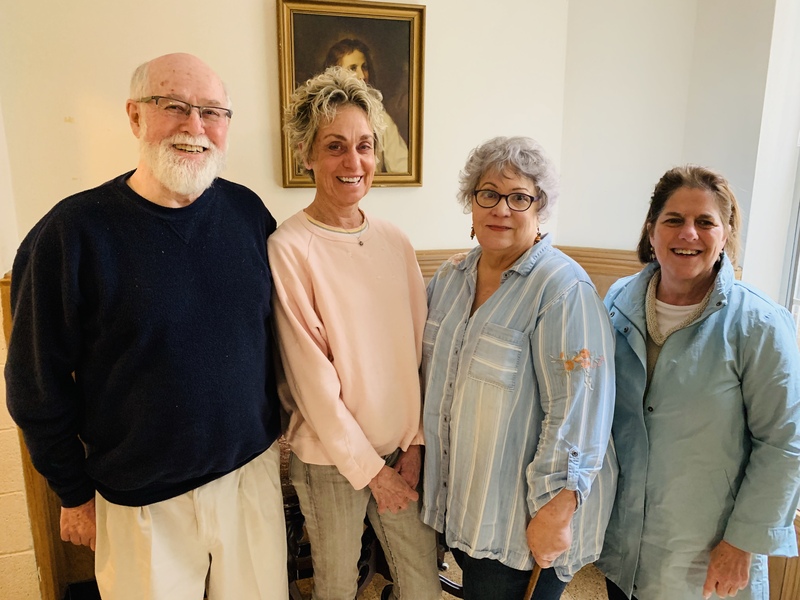 The Stewpot Board elected officers at their March meeting. The following officers were elected: Nancy Howell, Chair; Charlie Frith, Vice Chair, Ellen Rusell, Secretary and Connie Smith, Treasurer. The new officers are pictured below from left to right: Charlie Frith, Connie Smith, Nancy Howell and Ellen Russell. 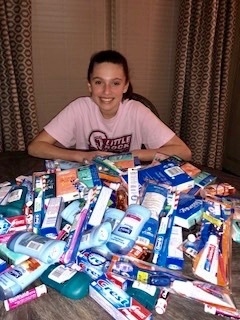 Peri Mitchell, an eighth grade student at Little Rock Christian Academy, is pictured with the hundreds of personal hygiene products she asked friends and family to donate for the homeless. Students in her Biblical World View Class read a book called "Do Hard Things". The book challenges teenagers to go out and do something beyond their comfort zone. Mr. John DiVito, their teacher, assigned each student to do a project. Peri chose to help the homeless because she felt this would influence her life not only now, but also in the future. 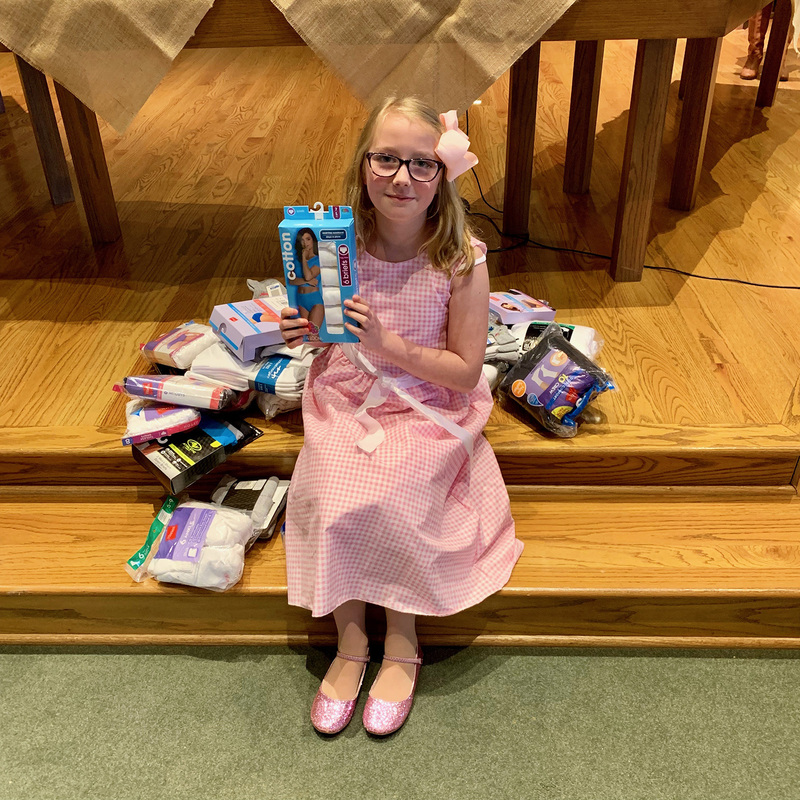 Lyric Rogers from Westover Hills Presbyterian Church recently celebrated her 11tha birthday. Instead of gifts, she asked her guests to bring socks and underwear for Stewpot. be working on Wednesdays and Thursdays. 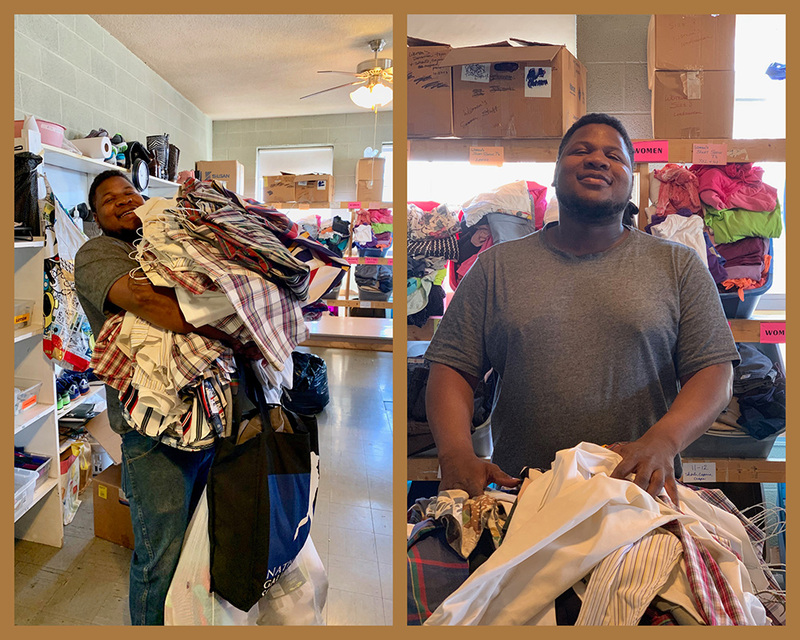 In addition to helping Ed with his many chores, Wesley will also be helping Barbara in the Clothes Closet on Thursdays. Be sure to welcome him when you see him. There were two retirements at the Stewpot in January. We issued a moment of gratitude during the hauling off of two old and worn out refrigerators. One was used and donated years ago by a well-meaning supporter and the other just up and died. After a check from the Arkansas Hunger Alliance for $1695 delivered by Mary Bea Gross, Development Director of the Arkansas Hunger Alliance, and after a very brief moment of nostalgia we greeted two new freezerless refrigerators made possible by the Arkansas Hunger Relief Alliance grant. 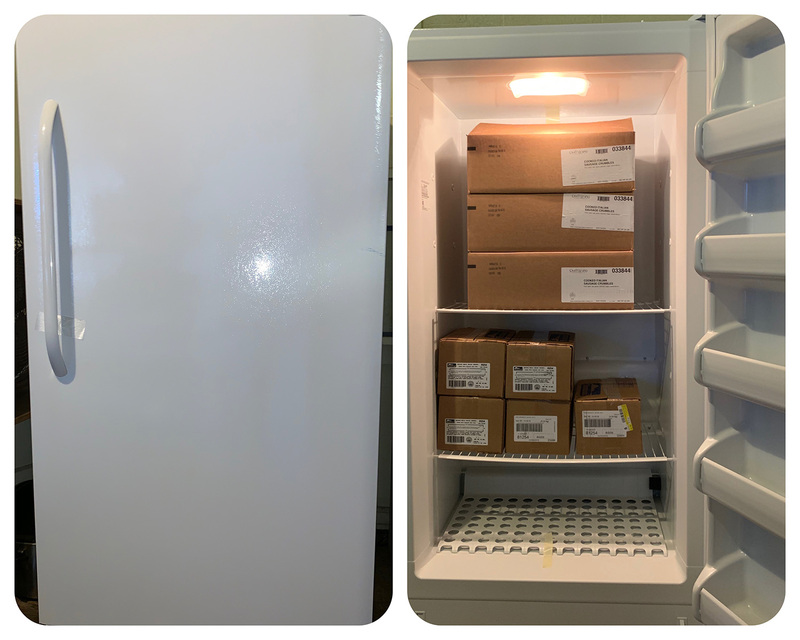 We welcome our new refrigerators and, more than that, offer our appreciation to the Arkansas Hunger Relief Alliance for once more supporting the mission of The Stewpot. 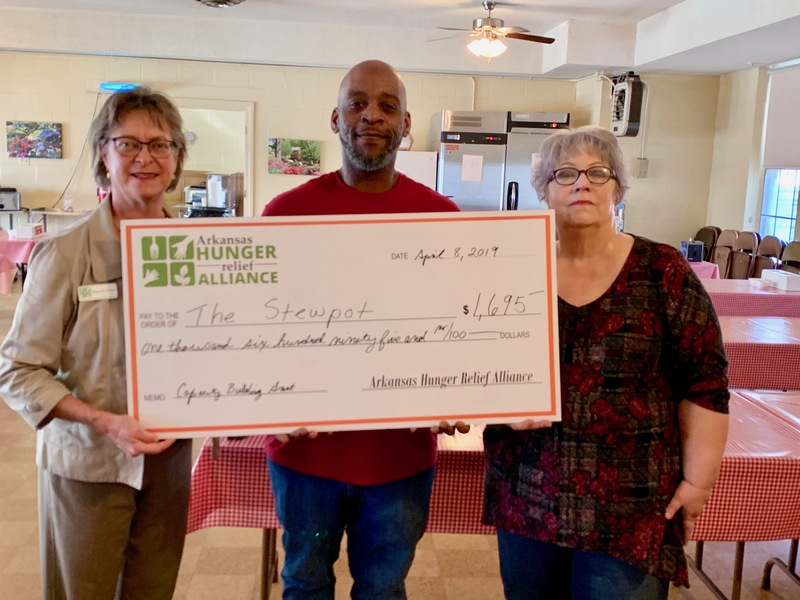 Shown below are Ed Brown, Day Manager of Stewpot, and Nancy Howell, Chariman of the Stewpot board, receining the check from Mary Bea Gross. Richard Sparrow works at the Stewpot on the 1st Friday of each month. He and his wife, Joy, are downsizing and are moving into a patio home. While cleaning out their house for moving, he discovered that he had a lot shirts that he could no longer wear. 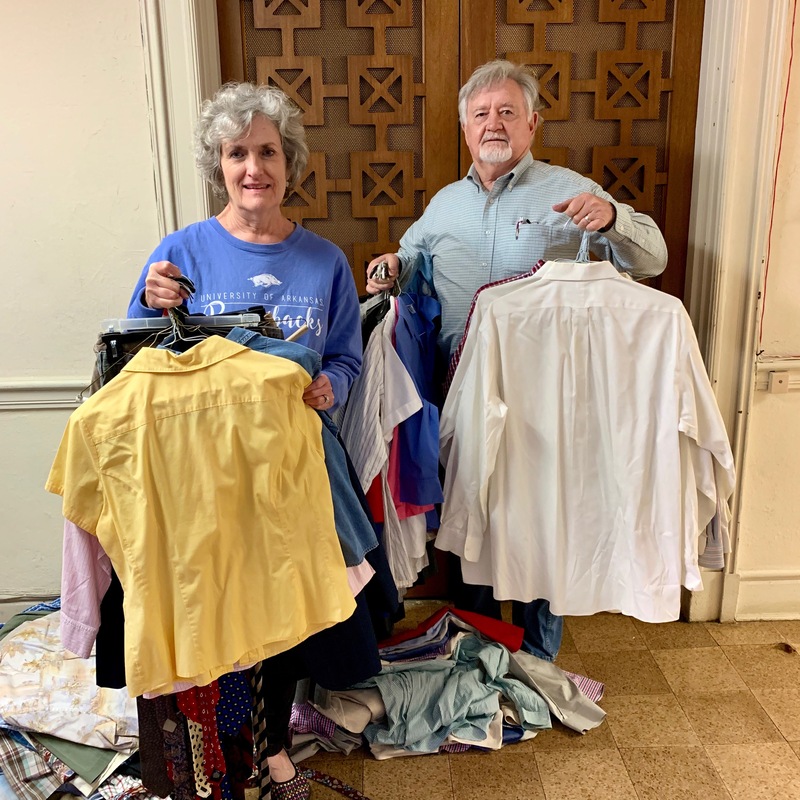 Richard and Joy brought almost 50 shirts of all styles and colors to the Stewpot on Monday, February 25.